Ramagiri Hills where the most of the mega block buster hindi movie "SHOLAY" was shot will wear a festive look on Saturday the 31st August 2008 on occasion of last auspicious Saturday in the month of shravana according to Hindu calender. Thousands of devotees across the state visit and offer their prayers to the presiding diety Lord Rama. 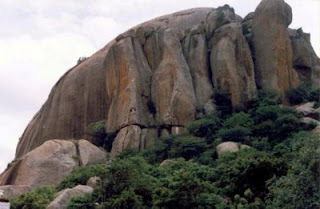 The Ramagiri hills is known as Mecca for mountain climbers for their preliminary mountain climbing lessons. Passage to India, Gandhi & more than hundred filims are shot in this picturesque mountains. 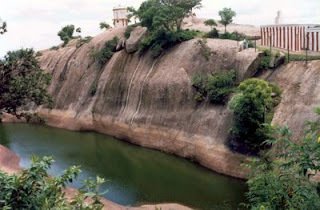 The rocks of Ramanagaram are also know world wide as "Closepete Rocks" (Closepete being the previous name of Ramanagaram). According to the local purana, Lord Rama along with his wife Sita Devi had a stay in this hills while they were in exile. During their stay an ausura named Kakasura in disguise as a crow tried to molest Sita Devi while Lord Rama was taking rest. Lord Rama woke up and killed Kakasura . Strange enough, no crows can be seen in this hills even today!. Do visit Ramagiri Hills on this auspicious Saturday the 31st August 2008 .